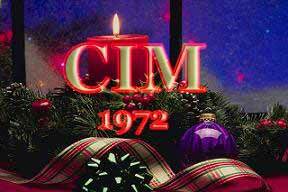 A free Internet Newsletter publication for all CIM Alumni and friends. There is an aphorism that says: "It's not your aptitude but your attitude that determines your altitude." One of the great men in history that fascinate me is Albert Einstein, not because he was a genius, but because of his attitude that I believe was formed and developed by the way he was brought up when he was a child. Although there are conflicting accounts that Einstein didn’t talk until he was three years old, what is not conflicting is that it took him a little longer to talk than the average child. But if you think about it, Einstein was far from average. Einstein was a first born and the way he was brought up by his parents made a big influence in shaping him to greatness. His parents hardly coddled him. They gave him tremendous freedom to roam and grow. When he was four years old, he was allowed to roam the neighborhood alone, was encouraged to cross the street on his own while his parents watched him only few times to ensure that he looked both ways, and after that he was on his own. It reminds me of the movie The March of the Penguins in which the little penguins were allowed to march around and then soon they were left alone to take care of their own. Well, you might say that during those times, the little Einstein wasn’t dodging cars, trucks and SUVs speeding at 65 miles/hour. Indeed, the young Einstein was dodging only horse drawn carriages. But it was still very dangerous for 4 year-old kids. Yet nowadays how many parents would allow their child to cross even a street on the park or on the neighborhood? Many of us could hardly even get off the back of our married children; we still tell and remind them over and over what to do and what not to do the way our parents brought us up. But by doing so, we unwittingly stifle the development of the children's courage and confidence and thus make them fearful and insecure. Many of them become perfectionists and thus are afraid of mistakes and failures, never realizing that mistakes sometimes are the only way to reach perfection, and to measure how hard they've tried. Some of them treat the mistakes of others even the ones in their family that inconvenient them, not with patience and understanding, but with anger and resentment. With our stiffling rigidity, the children grow up like birds with wings not fully developed because they received little direction about how to flap their wings and fly, let alone encouragement and freedom to have enough experience of their own. We coddled them when they were little, and then build a nest for them and constantly hover over them. They grow up retreating within that nest, but not knowing how to fly. What made Einstein so different was his attitude toward mistake and failure. He was not afraid to fail or to be wrong. When Einstein was 50 years old, reporters were hounding him for an interview during which he was working on a unified field theory. To put it in laymen’s term, Einstein was working on a theory that would put the entire universe into a mathematical equation and thus he had the attention of the world. Reporters packed outside his home in the hope of an interview. Many kept all night vigils waiting for the story. Einstein was the kind who didn’t chase the spotlight and dodged the requests often. But he allowed an interview with one reporter from the New York Times – Carr Van Anda. Anda edited the Times and found an error in the math of Einstein’s previous equation. Just imagine – a reporter, not a mathematician, finding an error in mathematics of a mathematical genius. Others would have been irate and feel insulted. But not Einstein. On the contrary, Einstein was impressed and that is the reason he allowed an interview to this reporter from New York Times. He was not afraid to be wrong and when corrected he was not insulted. In any association especially alumni association, all too often not too many are interested in leadership positions. Either they are too busy with their own lives, or they just don’t want to add any extra activity to their personal and professional schedules, busy or not. After all, what can they get out of the leadership positions, anyway, except perhaps the risk of potential conflict that could lead to unpleasant outcomes? Why take the risk for doing something for nothing? In any situation, or in any group or organization, the prospect of making a difference is not without risk. There is always a chance of offending someone with what you think, say and do even as a leader. You cannot please every one, and it’s useless to even try it. There are always those who don’t like if not oppose every which way you choose. But you've got to do what you believe is the right thing to do regardless of what anyone thinks or says. If you don't have the guts to go against the grain, then you are not likely to make a difference. Having the guts doesn't mean an effort in blood, sweat and tears, or putting ourselves in stressful or unpleasant situation. It is simply the ability to strenghten ourselves in pursuing what we believe is good and right, against the fear of change and what others might think and say about us. But the question is: Is the risk worth the roll? It is; it gives you a great education like you’ve never had before. Taking the risk has a way of forging a path that leads you to the discovery of your own hidden talents and inner strenghts. You make a difference more in your own world than in others. You'll find it easier to handle difficulties as you learn to accept and understand that some things will come easily, and some won't. You'll even learn to believe that God never gives you more than you can handle. Learning involves gains based on the effort we expend. But the things we work on now will mean the most in the end. It's suffice it to say that many of those who seek leadership positions do it not so much for what they can do for the association, but for what the position can do for them – prestige, respect, or in short - status. They serve as a way to make a name for themselves, or to add something impressive to their credential, or to build an impressive resume or an impressive part of their obituary one day. Their attitude is such that the service they provide is primarily an investment – they have an ulterior motive. As a result, their leadership is ineffectual, and they are often mired with frustration and disappointment. Unable to see the profit in what they lose, achievement in their mistake, or unable to realize that each loss or mistake represents a step one needs to take toward growth and maturity, these leaders tend to discourage if not disagree with bold ideas to make a change. They are afraid that such ideas may not only rock the boat, they may also fail, and thus status quo is the safest way to go. They are afraid of being wrong and especially of being corrected and criticized. Instead of accepting constructive criticism and getting better, they would argue vehemently and demonstrate how they are right. But with this attitude, they'll never develop what it takes - the willingness to pay the price to create change. For some reason, in every Filipino association that I've been a member or officer of, bickering is all too common. Disagreements often create suspiciousness. Officers or leaders who develop and nuture suspiciousness would readily resort to favoritism for loyal friends like it's a good thing to do. Sadly, favoritism that is almost always based on biases and prejudices, not on fairness, has a way of splitting the association rather than uniting it. Moreover favoritism often leads to gossiping. Gossip is like a flu virus that tends to infect every one who listens to it. Those who enjoy the infection spread it, and those who don’t, isolate themselves. There is an old legend that tells of a monastery in France. This monastery is well-known throughout Europe because of the extraordinary leadership of a man known only as Brother Leo. Several monks began a pilgrimage to visit Brother Leo to learn from him. Almost immediately the monks began to bicker over who should do various chores. On the third day they met another monk who was also going to the monastery and he joined their party. This monk never complained or shirked a duty, and whenever the others fought over a chore, he would gracefully volunteer and simply do it himself. By the last day the other monks were following his example, and they worked together smoothly. When they reached the monastery and asked to see Brother Leo, the man who greeted them laughed: "But our brother is among you!" And he pointed to the fellow who had joined them late in the trip. The parable about Brother Leo teaches us a certain model of leadership, where leaders are preoccupied with serving rather than being followed, with giving rather than getting, and doing rather than demanding. It's a form of leadership based on example, not command. It’s a form of leadership that earns trust and respect, not expects them. Trust is the most essential ingredient in effective leadership especially of an alumni association. As a leader, the lack of trust would easily convince you that most of your colleagues are against you, that what you're doing is a losing battle, and thus, why even work at all, let alone work hard for the association? Trust is the foundation that holds all relationships together - professional, personal, social, family, etc. Trust cannot be demanded; it can only be earned, not by making promises but by keeping them; not through favoritism, but through honesty and fairness. Of course, there are those whom you can never earn their trust, not because you don't deserve it, but because they haven't learned to trust themselves. If they can't trust themselves, then how can they trust others? So no matter what you do, they'll maintain a degree of doubt and even cynicism. They are insecure because they haven't developed the honesty and self-awareness to challenge their limiting beliefs and ideas to have a sense of security. And it's a growing sense of security that gives you the freedom and confidence to take up the challenge more and more. Now imagine if in our alumni association in particular, we put aside differences and get rid of any remnant of suspiciousness and toxicity of grudges so we can sincerely cooperate and help each other work together smoothly without thinking of what we can get out of what we put in. Imagine the fun, joy and laughter - a lot more of them, not to mention accomplished projects - more of them too. Imagine the eagerness of each of us to see each other eye to eye with respect, trust and gratitude. We'd feel connected like links in a chain despite our differences. Each link supports and gets support from those around it. Can you imagine? I really hope you can. Well, why don’t we all join the fun in Las Vegas in July 2006 alumni reunion with the thought that by just being there, we are already doing something for our association? There is a lot of time to arrange our work schedule to be able to attend. I’m looking forward to see every one of you there. Vegas, here I come! I hope I am not offending someone's belief by wishing you all - Merry Christmas and a Happy New Year! Congratulation to Hilga Vamenta, older daughter of Olga and Hector Vamenta of the Class 1972. Hilga has just been accepted to the Mississippi State University School of Medicine. It takes brains, focus and determination to produce the grades that can get a student into a School of Medicine here in the U.S. Hilga, hang in there! Four years from now, you’ll be one of our colleagues. And perhaps in another 5-7 years, we’ll be listening to your lecture with our hearing aids and some of us in wheelchairs. Just make sure your Dad won't go to sleep during your CME lecture. Hector has the tendency to snore. Keep jogging, ASPO! You have now something wonderful to look forward to, to cherish and to be really proud of. Two blondes were up in the far north woods, out looking for a Christmas tree. They were all bundled up from head to toe, carrying their hatchets and a coil of rope to tie on and drag it back. They had thought of everything. They were all set, but they couldn't find the right tree. They searched for hours, slogging through knee-deep snow. The wind was blowing and the wolves were howling, but they persevered. Had to get that Christmas tree, they’re determined. Finally, as the sun was beginning to head downward, one turned to the other and said, "That's it! I've had enough! The next tree we come to, we're going to cut it down, whether it's decorated or not!" Ole was working at the fish plant up north in Dulut when he accidentally cut off all ten of his fingers. "What do you mean, you haven't got da fingers?" he said. "Lord - it's 2005! We's got microsurgery and all kinds of incredible techniques. I could have put dem back on and made you like new! Why didn't you bring da fingers?" "In what aisle could I find the Polish sausage." The guy, (clearly offended) says,"Well, yes I am. But let me ask you something. If I had asked for Italian sausage would you ask me if I was Italian? Or if I had asked for German bratwurst, would you ask me if I was German? Or if I asked for a kosher hot dog would you ask me if I was Jewish? Or if I had asked for a Taco would you ask if I was Mexican? Would ya, huh? Would ya?" With deep self-righteous indignation, the guy says, "Well then why did you ask me if I'm Polish because I ask for Polish sausage?" In ways you can’t wait to comprehend!